Our journey through the 1936 version of Flash Gordon is nearly over – there’s just one more chapter to go. At the end of last week’s episode we left our heroes sheltering from an attacking rocket ship (seemingly being piloted by their friend Prince Baron). Flash and the others escape through a convenient trap door, just as the tower is destroyed. Hang on! They cheated! There wasn’t a trap door last week! It turns out Prince Baron has been captured and the rocket ship was under Ming’s control all along. Flash and co clamber out of the wreckage of the tower but Vultan is injured. As they help him back through the tunnels beneath Ming’s palace they see Baron being taken to the dungeons. Flash fights off Ming’s guards and frees Prince Baron. The Flash Mob head back to laboratory, not realising one of Ming’s guards overhead their plan. Back in the laboratory, Zarkov explains that he wants Ming to attack them in the lab because they’ll be able to defend it. Ming falls for Zarkov’s ploy and dispatches guards to capture them and prepare the execution chamber. 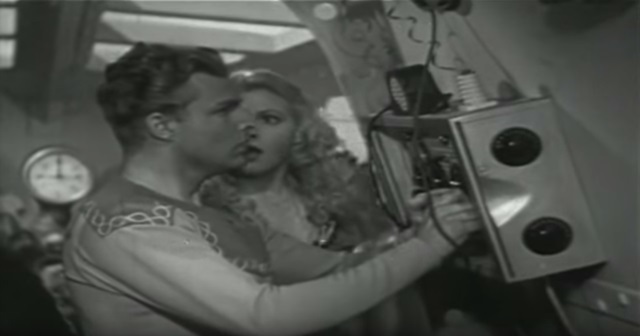 True to his word, Zarkov has a machine that electrifies the door to the laboratory. Everyone seems very happy they can hold out indefinitely using the device. Apparently food, water and pooping are not a concern on Mongo. Unfortunately, Ming is one smart cookie and he turns off the power to the lab. Just as Ming’s guards are about to recapture the good guys, an air raid siren goes off – Prince Thun and his lion men have arrived in their gyro ships. As Ming’s ships battle the gyro ships, Flash and the gang are arrested and taken to the throne room to witness their friends destruction. Things don’t quite go according to plan and Ming’s rocket ships appear to be losing. Deciding he’s had enough gloating, Ming sends the prisoners to the tunnel of terror but Thun and his lion men arrive just in time. They overwhelm Ming’s guards but Ming escapes. Fleeing from Flash and the others, Ming enters the sacred palace of the great god Tayo from which no man returns. At least, that’s what that devious little high priest tells them. Zarkov contacts Earth again and explains that they will be leaving for Earth soon, even though there is only a one in a million chance they’ll survive. But… the high priest has followed them to the laboratory and is clearly up to no good. Flash, Dale and Zarkov meet with Aura who tries to convince them to stay on Mongo but Zarkov and Flash insist they must return to Earth – for the benefit of science. After saying their farewells, Flash, Zarkov and Dale set off for Earth in Zarkov’s rocket ship. Unbeknownst to them, the high priest has placed a bomb onboard. 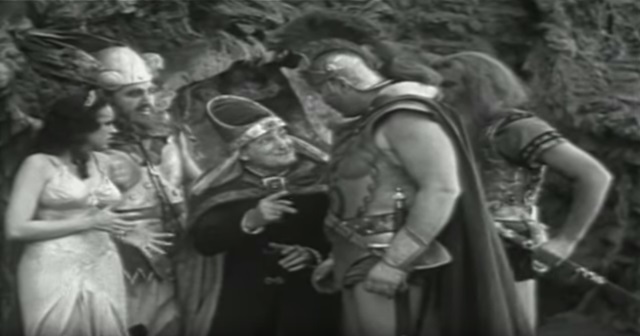 Fortunately, the high priest’s gloating tips his hand and Prince Baron is (eventually) able to warn Flash about the bomb. Hero that he is, Flash throws the bomb out of the ship. Despite the odds being stacked against them, Zarkov manages to pilot the ship back to Earth. As they land, Flash and Dale finally fall into each other’s arms. Ahhhh. The high priest is at his Machiavellian best when he turns up to gloat to Aura and the others. 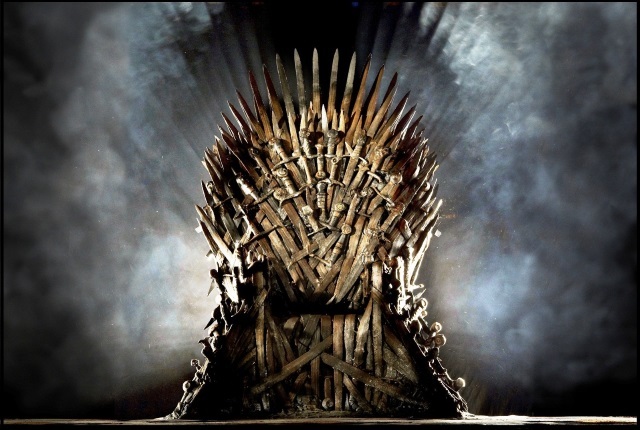 And I didn’t notice until today that Ming actually has his own sparkly version of the iron throne. “Oh, boy, that was a lucky one.” – Flash Gordon after almost being crushed by an exploding tower. I’m going to go with Flash himself this week – after all it’s his show and he did find the timebomb and throw it out of a moving rocket ship. So that’s it for my trip down memory lane. It must be over 30 years since I lasted watched Flash Gordon and I have to say, it was a lot better than I was expecting – even the acting was reasonable (okay, apart from Prince Baron). 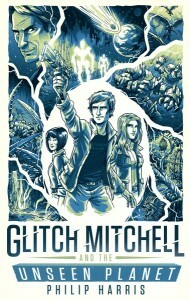 Yes, the plot was almost undecipherably random at times, and there’s deus ex machina galore, and the characters are pretty much one dimensional (Flash fights, Dale raints, Zarkov invents things, Vultan laughs), and the dialogue is cheesy, and everyone is stupid/smart as required by the plot (sometimes both at the same time), and Buster Crabbe’s fight scenes aren’t a patch on Jason Statham’s but that’s not the point. Flash Gordon is fun – pure, unadulterated, completely bonkers fun and I really enjoyed stepping back to a time when action and excitement took priority over gritty realism. Don’t get me wrong, I love shows like True Detective, Hannibal and American Horror Story as much as the next ageing Goth but not everything has to be overladen with artfully shot angst. Sometimes all you want to do is watch a bunch of people trying to escape an alien planet ruled by a melodramatic megalomaniac. And shadow puppets, don’t forget the shadow puppets. My homage to Flash Gordon, Glitch Mitchell and the Unseen Planet, is available now. For a limited time you can pick it up on kindle from Amazon US, Amazon UK, Amazon Canada and the other Amazon sites for just 99c. The paperback edition is also as cheap as I can make it – $10.95. The offer expires soon though so don’t hang around. Overall, the experts are right, this was the best cliffhanger serial ever produced. Two others came extremely close in my book, Flash Gordon Conquers the Universe and Perils of Nyoka, aka Nyoka and the Tigermen. Perils of Nyoka has the best number of A+ cliffhanger chapter endings of any serial I have seen, but the masterful characterizations in Flash Gordon still gives it the edge. By the way, Charles Middleton also starred in the Nyoka serial, but he took his orders there from Nyoka’s rival, a woman named Vultura. 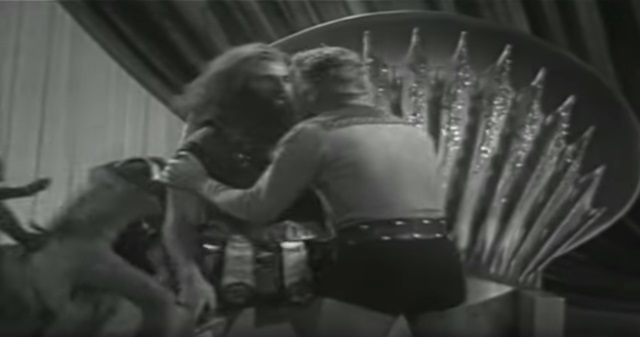 I must not leave before thanking the author of this website for his time and effort in creating the best online analysis available of the 1936 Flash Gordon serial. 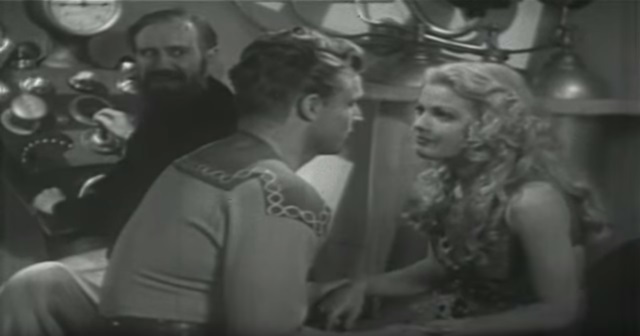 Buster Crabbe became famous because of his success as Flash Gordon and it is fitting that you named Flash as the best character in the final episode.